In 1922 a lone woman arrives in a filthy frontier mining town in the Pacific Northwest. Her goal: to resurrect her dead uncle’s newspaper. Within two days a naked man is shot dead, a famous man is rumoured to be heading their way and the only man capable of fixing her broken-down press so that she might spread this news is a Chinese printer from the nearby forbidden settlement of Lousetown. Over the next month, Lila Sinclair will take even bigger risks to see her business thrive—from her questionable news reporting to her negotiations with a partner who’s a liar and a gambler. Reckless, stubborn and with a maddening tendency to shed tears when provoked, Lila works long hours next to her printer to see her dream through, only to discover all that she could lose. Inspired by the historical figures Morris “Two Gun” Cohen and Dr. Sun Yat-sen, whose joint pursuits would later bolster a revolution that ushered in the modern era for China, and further informed by Puccini’s La Fanciulla del West, with its themes of intercultural love in the Old West, fact blends with fiction in a dramatic tale that is part historical novel, part steampunk opera and part otherworldly Western. 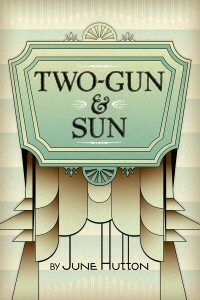 Brutally beautiful, at times playful and absurd and then swiftly tragic, Two-Gun & Sun (Caitlin Press 2015) explores themes of truth, love and independence.